Our modern world is often characterized as fluid, in which the flow of capital, the stream of people and the flood of products follow multiple paths to keep the pulse of our modern life beating. Mobility of people and objects is clearly linked with the process of globalization. Migration and globalization are indeed twin processes that have transformed the production of space. This means that the modality of our quotidian routine is both composed and affected by movement, whether from the village to the city, from job to job, from residence to another, from the window of our web browser to our smartphone screen, etc. Looking closely on the state of social movement among Indonesian migrant workers in Hong Kong and Japan, this essay attempts to expand the meaning of labor migration and consider the figure of migrant workers as active agents of cultural and social movement. They are accumulating individual and collective resources to perform everyday resistance to the existing power structures, and therefore have the potentiality of producing a social transforming space through the act of migration. The stream of Indonesian labor export has been going on since the late 1970s, in the era when Indonesia maintained open economic policies and entered the network of the newly industrializing countries of Southeast Asia. In the mid-80s, the rapid economic growth of the “Asian Tigers” (Singapore, Japan, South Korea and Taiwan) and the declining fertility rates in those countries led to a demand for migrant labor among Asia’s rapidly developing countries (Kaur, 2009: 288). Subsequent to the financial crisis that hit Asia in 1997-1998, Indonesia and the Philippines became the largest labor exporter in Southeast Asia and at the same time, uneven economic development contributed to increasing feminization of labor migration in the region. The number of Indonesian migrant workers in Hong Kong total around 150,000 with 90% of those being female domestic workers. Indonesians are the second biggest migrant workers group after the Philippines. Meanwhile, the number of Indonesian migrant workers in Japan is relatively small with only around 15,000 people. For Japan, the largest groups of migrant workers are those from China, Brazil and the Philippines. 1 Seventy percent of Indonesian migrant workers in Japan are male; they work in the fields of manufacturing industries, construction, agriculture and fisheries. Certainly, migrant laborers are driven to travel to other lands to find gainful work and enrichment. Yet more often that not, this can turn out to be little more than a pipe dream. Indonesian migrant laborers are vulnerable right from the beginning of their journey. Starting from the point of recruitment, many are misled by labor brokers about their wages or conditions abroad and some have to pay excessive fees to get their job applications accepted. There are many cases of abuse related to the lack of transparency on working condition and failures to provide sufficient information about workers rights prior to departure. Reports have shown that migrant domestic workers often suffer severe forms of exploitation, which includes psychological, physical and sexual abuse particularly those who are working in Malaysia and Saudi Arabia. The degree of violence that Indonesian migrant workers in Japan experience is perhaps less dramatic than several cases of abuse taking place with their counterparts elsewhere. However, working conditions in Japan might be far more notorious compared to other countries and these stories are less visible to the public. Most Indonesian migrant workers reach Japan through the ‘G-to-G’ program called The Technical Intern Training Program (TITP) that was signed in 1993. A private recruitment agency is also taking part in exporting “trainees” to Japan. The program is called a training program because it is designed as a platform for three years technological knowledge transfer from the Japanese to the Indonesian people. However, the fields in which they are working on do not require (or provide) any skills, and in this way the TITP is basically a deceitful strategy to import cheap labor. By labeling Indonesian (and in general, Southeast Asian) migrant workers as trainees, the government of Japan is systematically relinquishing the employer’s responsibility to provide these workers with appropriate labor rights (standard wages, insurance, and holidays) as regulated by the labor law. Moreover, the Japanese migrant labor law has very strict regulations on residency and under the training program the contractual agreement is limited to three years with no chance of the workers coming back to Japan. Due to larger demands on the labor force, particularly related with the need of construction workers for the upcoming 2020 Olympic which Japan is hosting, there is a plan to extend the contract to five years. When compared to other international travelers, such as tourists, businessmen or students, migrant workers have little power to decide where and when they can travel. Furthermore, they live in a state of insecurity with little choice over where or how long they might stay. Under short-term contracts, corporations can exploit migrant workers’ time and energy to maximize their profit with minimum responsibility. In the mean time, temporary working contract mean migrant workers have little opportunity to organize any kind of collective struggle to demand more fairness from the state or their employers. In the meantime, Hong Kong’s migrant labor regulation is also restrictive and exploitative in many ways. A particular problem rises from the government’s inability to control licensed recruitment agencies that charge illegal fees and leave migrant workers in debt. Many agencies also hold migrant worker’s personal documents and if these workers decide to quit their jobs, Hong Kong law states that they must leave the country within two weeks or apply for a visa extension which prohibits them from working. With such condition, many migrant workers ended up stuck in the homes of abusive employers because they are afraid of the consequences of resignation. But unlike the situation in Japan, there are more migrant-worker led organizations and NGOs that channel migrant workers’ demands for better working condition. One of the most famous cases is of the abuse of Indonesian migrant domestic worker, Erwiana Sulistyaningsih, at the hands of her employer in Hong Kong. Erwiana’s case is exceptional because she showed bravery to speak out and was supported by unions and NGOs to bring the case to Hong Kong’s courts and demand justice. Through Erwiana’s case, the spotlight of international attention shone on Hong Kong and with it pressure for the transformation of labor regulation for migrant workers. 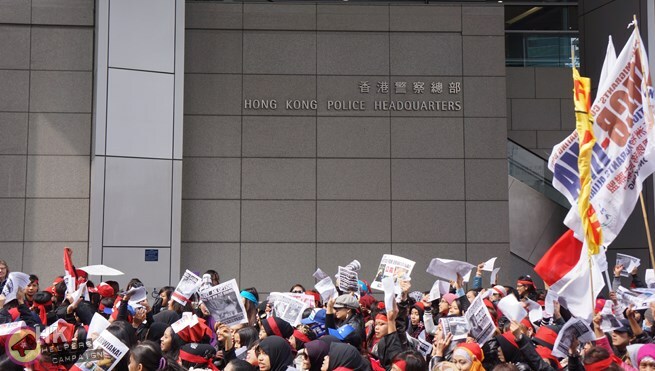 Over 5000 Indonesian domestic workers rallied at police and government headquarters to demand justice for Erwiana Sulistyaningsih who suffered ‘torture’ by her Hong Kong employer. Dozens of locals people and expats also took part in the protest. Solidarity among Indonesian migrant workers in Hong Kong is an accumulation of the workers’ everyday resistance and their power of self-organizing individual and collective resources. Besides their own agency, the urban environment in Hong Kong provides a productive shared social space for the migrant workers to occupy. Hong Kong is a city that homes many migrants; it has always been an international trade hub with inhabitants of various nationalities. Indonesian migrant workers in Hong Kong are known to turn the biggest park in Hong Kong, Victoria Park, into their own huge picnic ground every Sunday. The area has become a small Indonesian village where many shops and advertising hoardings are written in Indonesian. A similar situation also apparent around the “territory” of the Filipinos migrant workers, where shops, restaurant and karaoke bars targeting them as consumers. Indeed, the division of space by nation/ethnicity is still apparent in Hong Kong. However, the division of space in Hong Kong still allows space for intercultural interaction. Standing on a street in central Hong Kong, one hears a multitude of languages. Several tourists and Hong Kong residents visit Indonesian or Filipinos restaurants, thereby the idea of a “local” Hong Kong identity becomes more liquid as different cultural experiences might be found in one place. Indeed, the organization of space is nearly always constructed through the social division of race, class and gender. The ability of migrant workers to exercise their visibility has produced a multiple configuration of space that transforms the identity of contemporary Hong Kong. 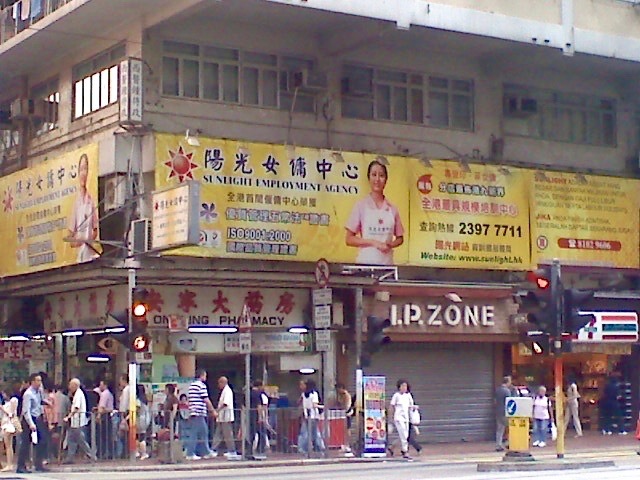 Advertising hoarding on King’s Road, Hong Kong for an agency specialised in foreign domestic helpers. While this has taken place in Hong Kong, one possible aspect that restrained Indonesian migrant workers from developing a self-organized community in Japan is that they are dispersed in several remote areas in the country. Costly travel has made frequent physical gatherings very difficult. Moreover, compared to Hong Kong, which has strict rules domestic migrant workers’ holidays, Japan’s labor laws are not enforced for providing workers with a proper weekly day off. Many migrant workers who work in agriculture and fisheries have irregular days off therefore they rarely meet with each other at those times, even with friends who live in the same accommodation. The way migration produces a shared space for living is an important matter for cultural encounters. However, the planning authority’s mechanisms of organization is not undertaken with the cultural encounters of migrant workers in mind. The urban landscape is organized with the logic of tourism and commerce, where monuments, parks and all shops are located in the central area of town, while factories and farms are placed in outlying areas with limited access to transportation (Franklin, 2003). The latter is where the Indonesian migrant workers in Japan are sent to work. They remain invisible in the pulse of daily life, although they are key figures that keep daily live ticking over. The socio-political flows and the continuous making of shared social space in Hong Kong has made possible the founding of clear identities among Indonesian migrant workers. Whilst in their daily life as domestic workers, many of these women remain ignored and marginalized from the pulse of Hong Kong metropolis, yet on the weekend, their efforts at reclaiming their individual and communal identities are plain to see at Victoria Park. Gathering in a public space becomes a way of asserting their presence and togetherness, and in this situation the migrant workers are empowering each other by sharing resources, knowledge and experience. Most of them receiving no more than high-school education, yet under such limited circumstances, their collective consciousness is more emancipative and empowering than that of the high-skilled labor (or the so-called expatriate) who might live for individual pursuits in a comfortable surrounding. 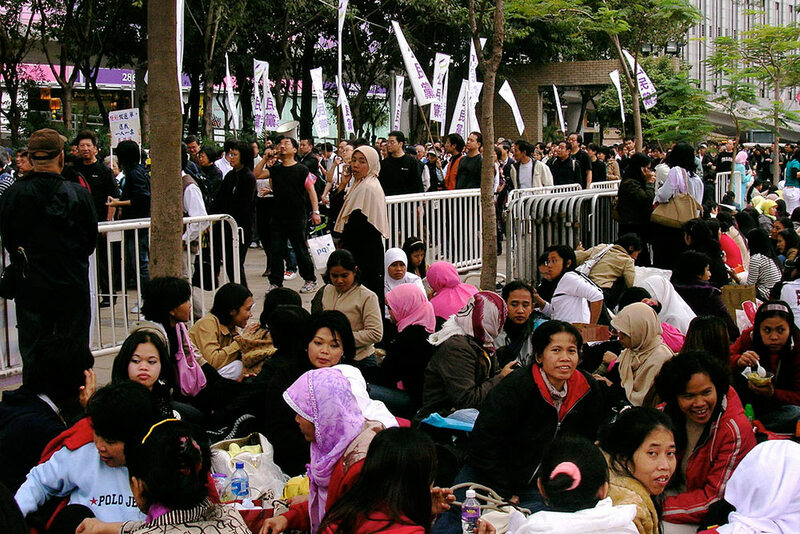 Indonesian domestic helpers congregate in Hong Kong’s Victoria Park on Sunday, while a protest marches in the background. Various types of affective labor are actually having the potential to create intercultural understanding that begins from domestic spaces. In the ideal working condition, domestic workers in Hong Kong could introduce their culture and create more humane relationship with their employer instead of sustaining mere master-slave relations. Indeed, sometimes conflict also arises from small cultural differences. For example, many Indonesian domestic workers don’t eat and don’t know how to cook pork. Yet, by dealing with this situation, domestic workers are agents of cultural translation. The notion of translation allows us to see culture as an ongoing process of interaction with the others rather than being fixed and a rooted identity. In that sense, migrant domestic workers are important figures for producing the space for encounters between cultures which starts from the domestic space. Most Indonesian migrant workers in Japan live in accommodation provided by their employers. Present restrictions from the government means migrant domestic workers cannot live not in their employer’s house. On the one hand, it is good because it prevents domestic workers from working round the clock. On the other hand, unrestricted spaces for interaction between migrants and Japanese residents are needed to generate a harmonious and less exploitative relationship. In Ibaraki Prefecture, where most Indonesian migrant workers work, 4 there is an Indonesian café owned by an Indonesian woman who is divorced from her Japanese husband. She told me that many Indonesian migrant workers often eat and hang out in the café along with local Japanese residents who also dine there. My emphasis on the existence of an Indonesian café in Japan does not suggest the need to develop an ethnic (or nation) based community for migrant workers. Rather, I am suggesting spaces which are able to create further cultural interaction; spaces that are able to untangle preconceived stereotypes. The struggle for demanding better migrant labor regulations often focuses on economic matters, yet it is also important to think of material conditions beyond the purely economic. Brigitta Isabella is a member of KUNCI Cultural Studies Center in Yogyakarta, Indonesia. She is also part of the editorial collective SOUTHEAST OF NOW: Direction in Contemporary and Modern Art, a new refereed journal to be published in 2016. Her research on Indonesian migrant labor was supported by Para Site gallery (Hong Kong) and Dislocate (Tokyo, Japan). Franklin, Adrian, “The Tourist Syndrome: An interview with Zygmunt Bauman,” Tourist Studies 3,2 (2003): 205-217. Kartikasari, Nindya, “Effects of Labor Immigration Policies on Indonesian Migrant Workers in Japan and South Korea.” Unpublished dissertation, Tokyo: National Graduate Institute for Policy Studies, 2013. Kaur, Amarjit, “Labor Crossings in Southeast Asia: Linking Historical and Contemporary Labor Migration”, New Zealand Journal of Asian Studies 11, 1 (June 2009): 276-303. Papastergiadis, Nikos, The Turbulence of Migration, Globalization, Deterritorialization and Hybridity, Cambridge: Polity, 2000. Thanks for this information.. can i share? I was wondering if i could ask you some question regarding migration movement between Indonesia and Japan? if that is so can I ask your contact.